Cells are the basic building blocks/units of life. They are the smallest structural and functional unit of an organism, which is typically microscopic. Organelles are organised and specialised structures found within the cell. All cells are held together by a thin plasma membrane, which acts as a boundary between the cell and the surrounding environment. It helps to maintain the the concentrations of certain substances inside and outside of the cell, different pHs ect as well as controlling the entry and exit of materials from the cell. Plasma membranes are also present in many other places in the cell, where they may separate areas that require different conditions to function (e.g organelles). The membrane is made of a p﻿h﻿osphid bilayer (labeled "lipid bilayer" in the diagram) which is selectively permeable, allowing only certain substances, generally small molecules to freely diffuse through the membrane. These phospholipids have freedom of movement in the "horizontal" plane: they can move around eachother and can flow with pressure, yet do not allow the membrane to break, and can seal itself if damaged. The membrane has many proteins embedded in it which are able to move through the bilayer because it is fluid, and help molecules that are unable to diffuse through the membrane to pass through. The glycerol-phosphate "heads" are hydrophilic, meaning they "love" water, whereas the fatty acid "tails" are hydrophobic and "hate" water. This hydrophilic/hydrophobic arrangement (amphipathic) aids the membrane by allowing it to assemble and reassemble itself, as well as seal itself if it is damaged, as well as providing an essential structure ("skin)" of the membrane. 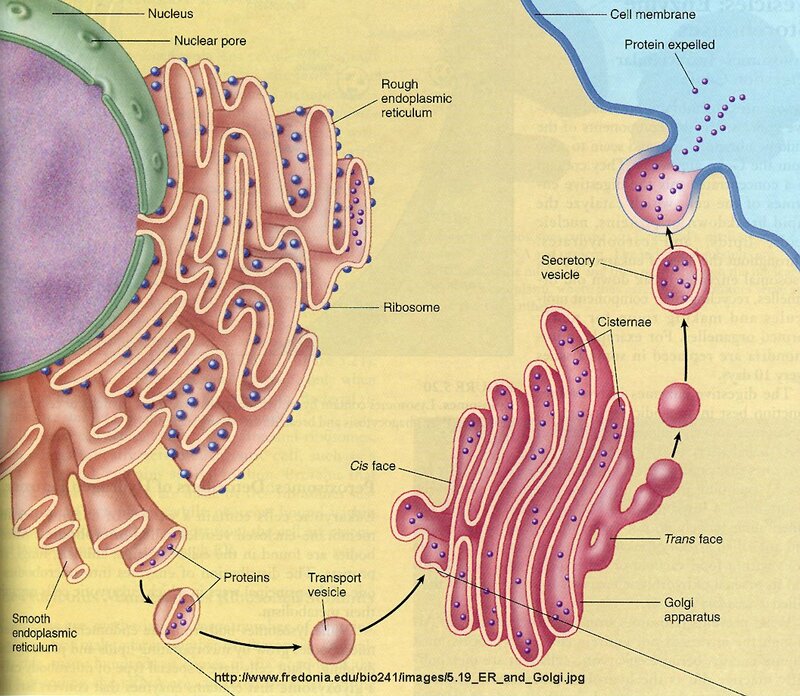 The membrane structure found around cell organelles is similar. Proteins on the outside of the membrane may be receptors (receives chemical signals from outside the cell) for chemicals such as hormones and neurotransmitters, and receptors for antigens (on pathogens). Other proteins in the surface allow the cell to recognise "self" from "foreign" cells. Proteins that penetrate through the membrane (transport membrane proteins, labeled as "large glycoprotein") can be sites of transport of substances into and out of the cell, often by active transport. They can also be enzymes, so extended networks of membranes can be a surface on which some chemical reactions of the cell are catalysed. The semi-permeable membranes allow the passage of only certain substances, small molecules such as oxygen, carbon dioxide and glucose. These molecules are small enough to freely diffuse through the membrane, while large molecules like starch are unable to do so, and must be actively transported across the membrane in order to get inside the cell. The membrane has many folds called microvilli, which greatly increase the surface are of the membrane, making absorption more rapid. They are found in cells that are very active in secretion (e.g pancreatic cells, synthesising and secreting large amounts of digestive enzymes, allows rapid secretion of large quantities of the digestive enzyme) and absorption (e.g cells lining the kidney tubules and the small intestine, increasing the surface area for reabsorption of substances such as glucose). The nucleus or "control center" contains DNA, the genetic material that controls and organises all cell processes. DNA is randomly spread throughout the nucleus as chromatin. When a cell is about to split and divide in mitosis, these become visible structures known as chromosomes. The nucleus contains the chromosomes/DNA which bear all the information needed to make proteins. RNA copies of this information are made as needed and taken out through pores in the nuclear envelope, a double membrane, to ribosomes to be translated into proteins. The nucleolus inside the nucleus produces the RNA (ribonucleic acid) component of ribosomes, which are involved in the production of protein. The nuclear envelope, a double membrane with pores at interval contains the nucleus. The pores allow material to move between the nucleus and the cytoplasm. During the early stages of cell division, the chromatin material condenses to form chromosomes. the chromatin coils up tightly into looped structures made of two chromatids joined by a centromere. The cytoplasm is made of fluid called cytosol, which is mainly water but has many substances dissolved in it, for example sugar, amino acids and mineral ions. Cell organelles are embedded in the cytoplasm. The cytoplasm is the site of the cell's chemical reactions (e.g glycolysis). The endoplasmic reticulum (ER) is a network of interconnected flattened tubes/membranes called cisternae which run through the cytoplasm and takes up most of it's space. the membranes enclose tubes which, in certain places, can be enlarged to form flattened areas called cisternae (which may temporarily store substances). Rough ER has ribosomes attached to it, and is part of protein production. Rough ER is therefore common in cells that make and secrete proteins (e.g digestive cells that produce enzymes, white blood cells that produce antibodies, as these are both protein). These are called secretory cells, which are cells that synthesise (create) substances, like proteins synthesised by ribosomes, and then release the substances through the plasma membrane to the exterior for use by cells elsewhere in the body. 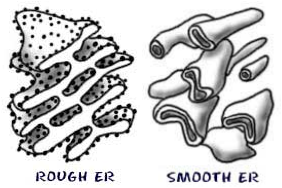 Rough ER is a large network of membranes covered in ribosomes, so that as proteins are made, they may be stored inside the ER before being sent off inside little vesicles to the Golgi. Smooth ER doesn't have ribosomes attached to it, and is used in the production of lipids, and are therefore common in cells that produce steroid hormones (e.g oestrogen, progesterone, testosterone) as fats and oils are associated with lipid synthesis. They produce phospholipids for new membranes, store calcium (these ions are especially important in muscle cells as they are needed for muscle contraction), metabolose carbohydrates, detoxify poisons and are involved in muscle contraction. They are also arranged as a network of membrane. The protein embedded in the membrane may be transport channels or else enzymes that enable smooth ER to catalyse reactions. ER also functions as a transport system by carrying materials from one part of the cell to another, as well as to and from the nucleus and to the outside of the cell. Ribosomes are the site of protein synthesis. They receive instructions from DNA in the nucleus, which they translate and amino acids from the cytoplasm are used to construct the proteins. They are made in the nucleus (in the nucleolus) and pass through the nuclear pores to the cytoplasm. They can attach to the ER (where they typically make proteins for use inside the cell), or be free in the cytoplasm (where they typically make proteins for use outside the cell, ie which are secreted), or are used in the cell's membranes. Ribosomes are made of two subunits (one small and one large), which combine to form the protein-synthesising unit. A functioning ribosome forms when both subunits join, which takes place only after mRNA binds to the smaller subunit. Most animal cells only have one Golgi body. The Golgi body looks similar to the ER, but consists of a stack of membrane sacs called cisternae (singular cisterna). The Golgi body modifies proteins made by ribosomes, then secretes them. Inother words it processes and packages proteins for export out of the cell. Most molecules pass through the Golgi body once they have been synthesised (made) in the ER. Transport vesicles carry the synthesised proteins from the rough ER, fusing to one side of the Golgi. Proteins then move to the nearest cisterna. A protein then moves from cisterna to cisterna and is modified as it goes by (e.g by having a carbohydrate added to form a glycoprotein, parts being added or chopped off). At the cisterna nearest the cell membrane, small vesicles with the modified protein pinch off, fuse with the cell membrane and discharge the contents to the outside. Golgi bodies are common in secretory cells, such as gland cells that produce hormones, or pancreatic cells that produce enzymes. Vacuoles are membrane bound storage sacs filled with fluid, keeping stored molecules separate from the cytoplasm so their contents don't interfere with cell processes. 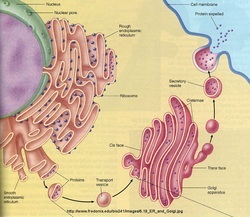 In animal cells and unicellular organisms, vacuoles are typically small and can perform a variety of functions (e.g food vacuoles form around food particles that enter the cell, which fuse with lysosomes for digestion; in unicellular organisms, contractile vacuoles collect water entering the cell and pump it to the outside). Vacuoles are typically large in plant cells, occupying much of the center of the cell. An immature cell has many small vacuoles. As the cell grows, the vacuoles fuse to form a mature cell that has one large vacuole, which occupies most of the cell volume. A large vacuole is important as a fluid skeleton. Water that enters the cell by osmosis collects in the vacuole, which then swells up and exerts pressure outwards on the cell membrane and cell wall. the cell becomes rigid or turgid. Turgid cells acts as support to keep plants with non-woody stems upright. The vacuoles are large bags of plasma membrane which are inactive, remaining in the center of the plant cell. This pushes the contents of the plant cells closer to the edge of the cell, making the distance for diffusion smaller and therefore more effective. This is why plant cells have the ability of being larger than animal cells. 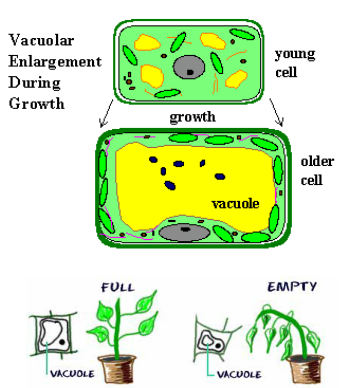 In plant cells vacuoles provide a storage space for the large amount of product produced in photosynthesis. It pushes the chloroplasts out to the cell membrane which increases the efficiency of photosynthesis as the light reaches them easily and it reduces the distance substances have to diffuse. These organelles are also known as "suicide bags" as they are involved in programmed cell death. Lysosomes are structured as small vesicles (little sacs of membrane) that contain digestive enzymes that surround and break down food when the lysosome fuses with a food vacuole. When lysosomes fuse with old organelles, the enzymes break down the organelle. The membrane keeps the digestive enzymes apart from the rest of the cells so they don't cause damage. Mitochondria (singular: mitochondrion) are commonly known as the "powerhouses of the cell" as they are the site of aerobic respiration, in which glucose is broken down in a series of enzyme-controlled chemical reactions to become carbon dioxide and water, along with the production of the energy stored in the bond of an ATP "energy molecule". This energy is then used to carry out essential life processes. Mitochondria are elongated ovals to increase surface area for diffusion. They have a double membrane (keeping the internal environment separate from the cytoplasm). The outer membrane is permeable so many molecules can pass through it. Molecules start on the outside of the mitochondrion, then continue in the fluid interior matrix (fluid filled space containing enzymes that can function on the large surface area created by the cristae. These enzymes catalyse the breakdown of glucose products into carbon dioxide and water), and ends on the inner membrane which is thrown up into folds called cristae (singular: crista). Cristae provide a large surface area for the respiratory chemical reactions known as the hydrogen transfer chain to take place, occurring due to lots of membrane-bound enzymes. Having a large surface area enables effective production of ATP. 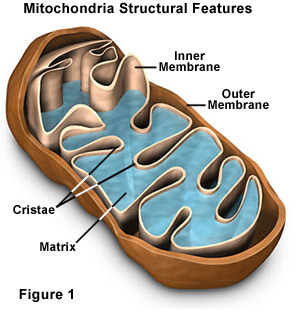 In cells with a large demand for ATP (e.g muscle cells) mitochondria contain even more cristae to increase the surface area, so maximising production of ATP. The space between the cristae is known as the matrix and contains many enzymes. In the site of the series of respiratory chemical reactions known as the Krebs cycle. Mitochondria are more common in animal cells than plant cells (because the energy demands of animal cells are typically higher), and are especially common in cells with high energy demands (e.g sperm moving to the ovum, muscles involved in contraction providing movement, liver as part of many metabolic reactions). The most active of these cells may have close to 1000 mitochondria. Cells lining the kidney tubules have a large number of mitochondria, as they are very active in re-absorbing substances by active transport. The higher the energy demands of the cell, the greater the number of mitochondria. Mitochondria have their own DNA and protein-making machinery (ribosomes, RNA), and it is believed that they may once have been free-living organisms (possibly bacteria) that were "captured" by other cells and then retained to become an organelle. Mitochondris can reproduce themselves. The fact that plant cells have a cell wall surrounding the cell membrane provides the main difference between plant and animal cells. Their function is to provide a rigid supporting structure for the cell. When cells are turgid, the cells contents push against the cell wall, holding it rigid. Primary cell walls are formed in young plant cells and consist of cellulose molecules bundled together into microfibrils, which are oriented at right angles to one another do they can provide strength to the cell. Each microfibril in the EM is about 20 nm wide; water and ions move freely through the mesh of microfibrils. Secondary cell walls are formed as the cell matures. They often contain a substance called lignin, which has stiffening properties. In such cells, the living material inside the cell often dies. These "dead" cells form most of the wood in a plant. The cell wall is made of layers of cellulose fibres. Each layer's fibres go in a different direction, and several layers criss-crossing to give the wall strength in several directions. The layers are porous, meaning they freely let substances pass through (unless thickened with lignin e.g in xylem tubes). Animals don't need a cell wall as they have a distinct skeletal system for support. The cell wall acts in the same way for a plant, enabling it a rigid support structure which contributes to the overall support and structure of the plant. Chloroplasts are large oval organelles found in leaf cells and cells in the outer layers of green stems (cells exposed to light) of green plants and algae. They are the sight of photosynthesis, in which carbon dioxide and water are joined together in a series of enzyme-controlled chemical reactions to become glucose. Solar energy is converted to chemical energy (ATP) to power the chemical reactions. These cells are found in abundance near the top of the leaves in plants and close to the plasma membrane to decrease the distance of carbon dioxide and water diffusion. They have a thin semi-permeable membrane to allow light penetration. Within the chloroplast are flattened membranes called thylakoids (increase surface area foe the absorption of light) arranged in stacks called grana (singular: granum). They contain the light-capturing pigments and are the site of splitting water into oxygen and hydrogen. These are connected to each other by tubes called lamellae, which are suspended in the transparent matrix, the stroma. Embedded in these membranes are green chlorophyll molecules, which "catch" solar energy. Thylakoids provide a large surface area for the light-dependent chemical reactions of photosynthesis. Between the grana is the fluid matrix known as the stroma, which is where the carbon dioxide and hydrogen (from water- oxygen is a waste product) are joined to form glucose in the light-independent chemical reactions (also known as the Calvin cycle) of photosynthesis. Chloroplasts are like mitochondria because they have their own DNA and protein-making machinery (ribosomes, RNA), and it is believed that they also have once been free living organisms, possibly bacteria, that were "captured" by other cells and then retained to become an organelle. Chloroplasts can reproduce themselves. Plants are autotrophs, and make their own food, whereas animals are heterotrophs, unable to make their own therefore consuming organic material. This means that they don't need chloroplasts as chloroplasts are used in creating energy and an organism's food, which animals don't need to do. Centrioles are present in all animal cells and most unicellular organisms, but not plant cells. They appear as a "tiny dot" next to the nucleus. They are made up of two identical cylindrical structures lying at right angles to each other. Each cylindrical structure is made up of microtubules. During cell division, the microtubules extend to form spindles, moving the chromosomes apart. Cilia and flagella project from some animal cells and many unicellular organisms, but not plant cells. Both are cellular projections and are almost identical in structure, but cilia are shorter and usually more numerous. Their internal structure is similar to that of the centriole. 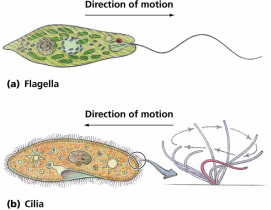 Cilia (singular: cilium) and flagella (singular: flagellum) are often associated with movement in unicellular organisms and some small animals. Sperm cells of mammals move by a single flagellum. Many of the cells that line the surfaces within our bodies are also ciliated. These cilia sweep substances across the cell surface. Cilia lining the cells of our respiratory tract beat upward, propelling a current of mucus that sweeps particles of dust, soot, pollen, and so on to the throat, from where they can be removed by swallowing.